Carpet maintenance is an important part of any home care routine. Carpets are seen and used so often that it becomes vital to the comfort of your home or office to have clean and fresh flooring. It can improve the look, feel and smell of wherever it is located. Routine vacuuming and spot stain removal can help but sometimes your carpet cleaning needs go far beyond these two helpful, but limited options. This is where steam cleaning comes in. Steam cleaning is often performed by carpet cleaning companies because it is an industrial type process. The job requires semi-heavy duty equipment in the form of a cleaner either mounted on a vehicle or a movable unit that works from an electrical outlet. Which one is used more often depends on the location of the carpet being cleaned. If reachable via roadway then the vehicle mounted unit is preferred. Long hoses that transport the hot water run into the area and preform the cleaning. This brings us back around to a main point in steam cleaning. That point is that it is not even steam cleaning. The cleaning is done by hot water that when sprayed onto a surface can remove dirt and debris that are lodged deep within the fibers. 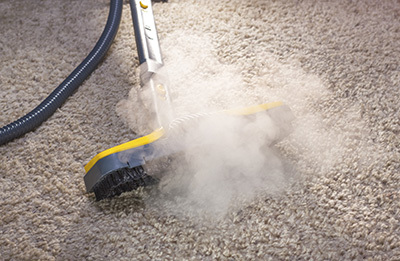 Actual steam would most likely cause serious problems to your carpet or flooring. The biggest benefit is just that steam cleaning gives you a much superior cleaning compared to other methods. Most experts and professionals agree that it is the most effective way to clean carpets. Another key benefit is that it reduces the amount of damage that is typically associated with carpet cleaning and rug cleaning methods. Steam cleaning does not over-wet the surface, over-wetting can lead to many issues including drying. Another great benefit is that steam cleaning only uses hot water, or at the most just a small amount of detergent. Other methods use chemicals that could be dangerous to people or animal whose skin touches the carpet. These are just a few of the many benefits of steam cleaning.